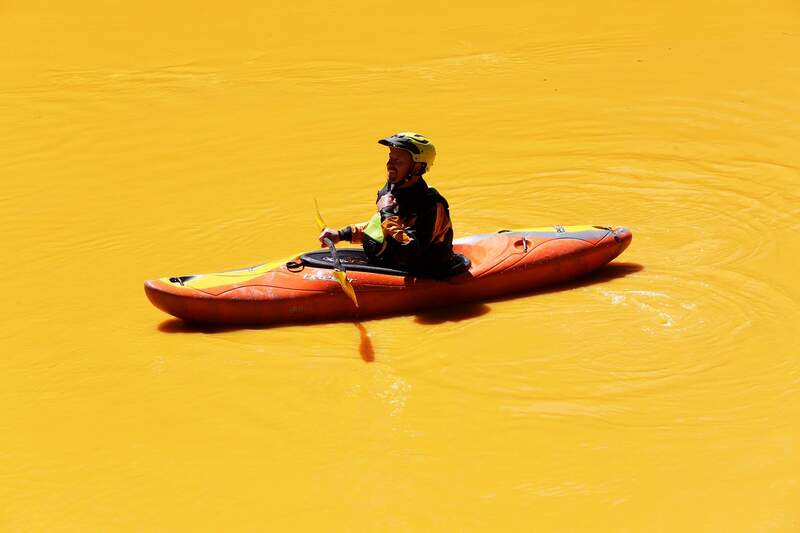 “The water tastes like iron,” said Eric Parker as he kayaked down the Animas River near Bakers Bridge on Aug. 6, 2015, the morning after his group ended up in the contaminated wastewater after the Gold King Mine north of Silverton blew out. A day after the Gold King Mine blowout, La Plata County Sheriff Sean Smith closed the Animas River to the public. The river stayed closed for nine days, preventing residents from getting in the water or doing any recreation in it. Rafting and fly fishing companies lost money during the closure, but some doubt they will see any lasting effect this tourist season. The Durango Area Tourism Office shared a figure in November: If media coverage of the Gold King Mine blowout were quantified in advertising dollars, the total would amount to a $4 million ad campaign. For many who consider the Animas River the lifeblood of recreational tourism in Durango, the sight of the passing orange plume was more than jarring: It was an attack on the area’s livelihood. Yet as major news outlets such as CNN, The New York Times and Al-Jazeera receded from Southwest Colorado just as the 3 million gallons of mine waste entered Lake Powell, so did the perceived stigma of the spill, said Bob Kunkel, executive director for the Durango Area Tourism Office. He said the issue of the spill might go on for decades locally, but lost its national spotlight. Still, the Durango Area Tourist Office is asking the Environmental Protection Agency to reimburse $345,000 for an advertising campaign to promote the region, in an attempt to repair any brand damage. And some businesses stinging from losses immediately after the spill are fielding calls about conditions. Others, though, don’t expect the Gold King spill to have a lasting impact on this summer’s tourism season. Gerhardt said the rafting companies in town took a heavy hit when the river was closed for eight days, and the fear of potentially contaminated water lingered for a few weeks. Rob Schmidt, a manager at Duranglers, said although fishing on the Animas has been really good, business seems to be slower than in the past four years. Mike Nolan, a farmer in the Mancos valley, said he heard about customers who wouldn’t touch food irrigated from the waters of the Animas River after the spill. As of Feb. 1, the EPA has received 45 claims from individuals and private businesses for reimbursements for costs associated to the Gold King Mine spill. The federal agency has not paid any of those claims, pending the completion of internal investigations. And with a two-year deadline to file requests for reimbursements, some Durango outfitters are taking the long view. “We just wanted to take the time to understand the complete picture,” Mild to Wild Rafting owner Alex Mickel said in November, explaining why he hadn’t filed with the EPA. The Colorado Department of Public Health and Environment paid both La Plata and San Juan counties from funds in an EPA/CDPHE Cooperative Agreement. An additional $197,792.20 was paid by CDPHE to La Plata County, and $220,666.91 was paid by CDPHE to San Juan County.